Screening of paralytic shellfish toxins in various freshwater cyanobacterial samples was conducted by a simple systematic method using HPLC. Several samples gave peaks indistinguishable from the standard toxins, but all of them, except for Anabaena circinalis from Australia, were found to be negative by reinvestigation of the samples spiked with standards, with different post-column derivatization condition or with samples partially purified using reversed-phase cartridge and charcoal columns. An Australian isolate of An. 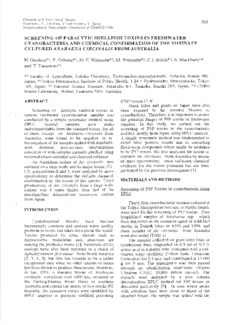 circinalis was cultured on a large scale and its major toxins, C1, C2, gonyautoxin-2 and 3, were analyzed by mass spectrometry to determine the definite chemical confirmation as the toxins of this species. Toxin productivity of An. circinalis from a large scale culture was 5 times higher than that of the dinoflagellate Alexandrium tamarense culture from Japan.